It is now possible to pay your (registration) fee with your VISA/Master credit card as well as with Ideal and PayPal. 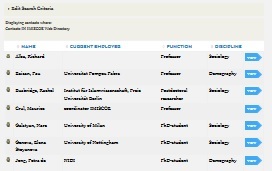 ​The IMISCOE Web Directory enables visitors to perform detailed searches in order to obtain information on individuals who participate in Europe's largest network of scholars in the area of international migration, integration and social cohesion. DELFT, LEIDEN AND ROTTERDAM LAUNCH NEW MSC. PROGRAM ON THE GOVERNANCE OF MIGRATION AND DIVERSITY.